Announcement Thank You for stopping by. U will find here variation of hand knitted clothes and accessories. Have a lovely stay at munamiu !!! Thank You for stopping by. U will find here variation of hand knitted clothes and accessories. All Braids Everywhere. Handknitted Cardigan. Choose Your Color. Braids and Cables Cardi. Choose Your Color. Textured Wool Mix Cardigan Jacket. 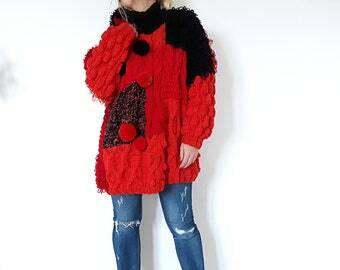 Loose Open Knit Sweater. Pure Cotton. Merino Wool Chunky Cardigan. Choose Your Color. Bubbles and Cables in White. Merino Wool Bubble Cardi with Pockets. Choose Your Color. Hi Lo Camel Shade Sweater. SALE! Gorgeous Stormy Beige Sweater with Lace Detailing. Bubble Cardi. Choose Your Color. Je viens de recevoir mon cardigan et il est parfait. Merci Monica pour votre travail et votre réactivité pour avoir répondu à mon message car cela m'a rassuré. La couleur est conforme à mon choix et la coupe est superbe. Je suis super satisfaite et bravo encore pour votre travail et je n'hésiterai pas à vous faire à nouveau confiance. What can I say accept gorgeous! Stunning!! Perfect for me!! Love the soft color palette. Shopped quickly. Thank you, Monika. All the sweaters with 10% OFF!!! Cable Pullover. Wool Blend Yarn Pullover. Welcome Everybody to munamiu's shop with unique kniited clothing and accessories. You always buy the actual piece pictured. In the case that the package is lost, money will be send back to buyer. munamiu accept payments through Paypal ONLY. If You are new to Paypal, don't worry, it's easy. All munamiu's items will be shipped within 24 hours (except Saturday and Sunday), by registered priority mail, after the payment is received. Approximate shipping time for Europe is about 5-8 business days. For other locations it takes about 14-30 business days. Of course, it can take few days more, or less (I hope). All the munamiu's items are handmade with care and passion.